Today my Little Artists and I talked about colors in motion. 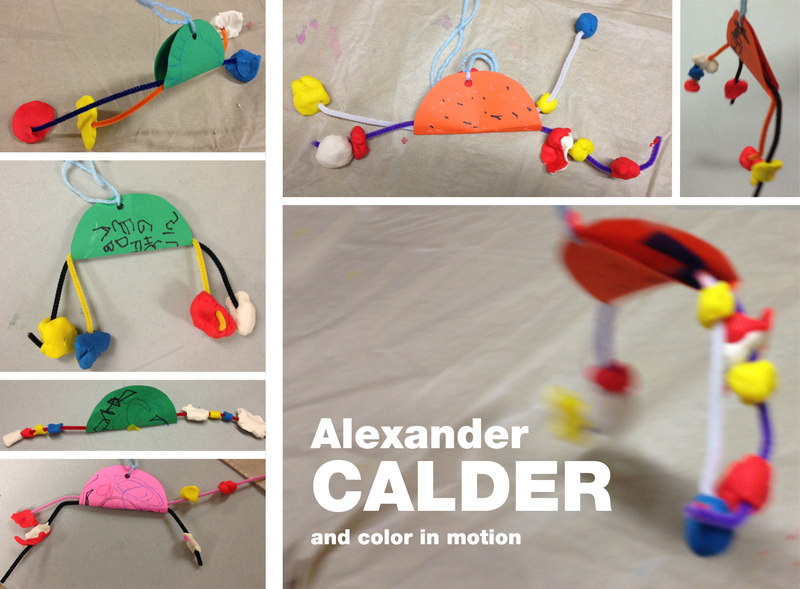 We talked about the mobiles they had above their cribs… and that Alexander Calder was the first person who made them, almost a hundred years ago. Why? He loved sculpture but thought that it missed something–movement. So, he tried to find a way to make his sculptures move. Then we discussed the most important thing when making a mobile: balance. What is a balance? It’s the way of spreading your weight equally so that you do not fall. Why is important? If the sculpture was not balanced right, it would drop to one side and would not move much. It needs to be just right so that it moved in the air. We also balanced ourselves – on our feet, on masking tape on the floor and on bumpy dots. After that it was time to make a balancing sculpture. We drew pictures on our colorful circles and then folded them in in half. I helped them attach the pipe cleaners inside, made a hole on the top and attached a string. The kids tried to balance it on their finger and then went on to add the fun part: play dough. They worked hard to balance their sculptures so that they did not lean too much to one side. Surprisingly easy for everybody (even the 3-year-olds). It was wonderful! This entry was posted in Art Projects and tagged alexander, art, ArTree, calder, color, craft, kids, mobile, movement, paper, pipe cleaner, play dough, preschool, sculpture. Bookmark the permalink.